From the Latin convallis for valley—a favored habitat for the plant—and majalis or belonging to May, this fragrant spring bloom derives its botanical name. Its other names are May Lily, Ladder-to-Heaven, Our Lady’s Tears but most popular of all is the lily-of-the-valley. Its flowers are usually white, although pale to darker pinks are less common but also popular. In folklore it was favored by the Norse Goddess of the Dawn, Ostara, while more recently it was delared the national flower of Finland in 1967. One legend claims the lily-of-the-valley sprang from the blood of Saint Leonard of Noblac who battled a dragon. Another tells of a nightingale that did not sing in the woods until the flower bloomed in May, signifying the return of happiness or a beloved. In Christian lore it indicated Eve’s tears on expulsion from Eden, or Mary’s tears when she found an empty crypt three days after her son’s crucifixtion. They are said to bloom spontaneously on the graves of those executed for crimes they had not committed. Called fairy ladders in Irish lore and the queen of flowers by John Keats. 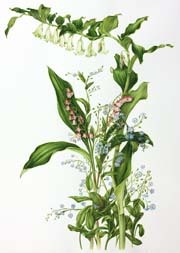 The shy beauty, dainty fragrance and demure presence of the lily-of-the-valley has been celebrated by many other poets and artists and it symbolized humility in religious painting. The plant also had a significant presence in folk medicine—the water of the flowers was used as a heart tonic, believed to strengthen the memory, cure gout and it was valued as an essential ingredient in love potions—all this despite its considerable toxicity. And let’s not forget the perfume industry’s efforts to imprison the plant’s delicate fragrance in a bottle, soap or lotion—never quite capturing the elusive lightness that only flowers attached to the plant release. From the Greek for mouse’s ear, which the leaf resembles, this genus obtains its name. There are several species in the genus and they are widely distributed in cool, damp climes. Forget-me-nots can be annual or perennial, with diffuse root systems. In the spring, on their straggly, tangled stems they bear small, almost flat, 5-petalled blue flowers—one cm. or less in diameter—with a bright yellow eye, encircling a ring of orangish red. So many distinct colors in such a minute surface! The seeds are enclosed in tiny tulip-shaped pods which disperse readily. Its common name translates from the French, ne m’oubliez pas, with similar variations in other languages. In one legend after all the plants had received names a tiny unnamed one cried out, “Forget-me-not, O Lord!” and God declared, “That shall be your name.” It was a popular belief that those who wore the flower would not be forgotten by their lovers. Henry IV adopted the flower during his exile in 1398, retaining the symbol when he returned to England the following year. Legends aside, what actual role could this humble little flower have played in the war ravaged Europe of the first half of the 20th century? Listen to its story: In 1926, at its annual convention in Bremen, Germany, the Masons of Grand Lodge Zur Sonneat chose this tiny blue flower as their emblem. In 1938 the Nazi Party Winterhilfswerk selected the very same flower for its badge and it was manufactured at the very factory that supplied the Masons with their emblem. Freemasons could now openly wear their forget-me-not badge as a secret sign of fraternal membership without fear of detection. Freemasons around the world continue to display the badge on their lapels as a reminder of suffering in the name of their fraternity, particularly under the Nazi regime. The little Forget-me-not has surely earned its name! The Latin name Polygonatum means many-jointed, referring either to the numerous knots or swellings of the root, or to the numerous nodes or joints of the stem; multiflorum distinguishes this many flowered species from others in which the blossoms occur singly or in pairs from each axil. King Solomon, ruler of Israel from 961 to 931 B.C.E., is said to have owned a magical signet ring which showed two triangles, one pointing up and the other down. They symbolized water and fire, the combination of opposites, union of body and soul, transmutation and his seal was said to endow the king with supernatural powers. Each year when the stem withers on the rhizome of the plant a scar remains, similar in appearance to a seal. This resemblance accounts for the plant’s common name. Since the scars also resemble knobs, they account for the scientific name denoting many-jointedness. Underground, as the root-stock creeps along, it is thick and twisted, gnarled and knotted, scarred at intervals from the numerous nodes or joints of the leaf stem of previous years. From these swellings we can read the age of the plant. Above ground the stem of the plant starts off vertical and sturdy and then arches over gracefully, almost parallel to the earth beneath for the rest of its considerable length. The stem is smooth until the first leaves appear to embrace it, in an alternate arrangement to the end. Where the large, broad, deeply-ribbed leaves attach to the stem you can detect a pale raised crescent. Elongated trumpet-shaped flowers dangle from pedicels, connected to the peduncle which attaches in the embrasure between stem and leaf. This point of attachment held me riveted during the weeks I spent in the plant’s company, as did its sinuous, meandering trajectory. In folk medicine the plant was reputed to relieve a host of maladies from mending bones, healing injuries, soothing gastrointestinal distress, menstrual cramps, and menopausal discomforts to alleviating symptoms associated with diabetes, insomnia, kidney dysfunction, infertility, removing skin blemishes and increasing mental concentration. No wonder the majestic plant bends under the weight of such responsibility! © 2009 – 2014, milly acharya. All rights reserved.